Posted on November 30, 2014 by Thorsten R.
The precipitation system has been partially upgraded. The speed of falling raindrops now follows a physical scaling with droplet size, and the system renders now hail in addition to rain and snow. 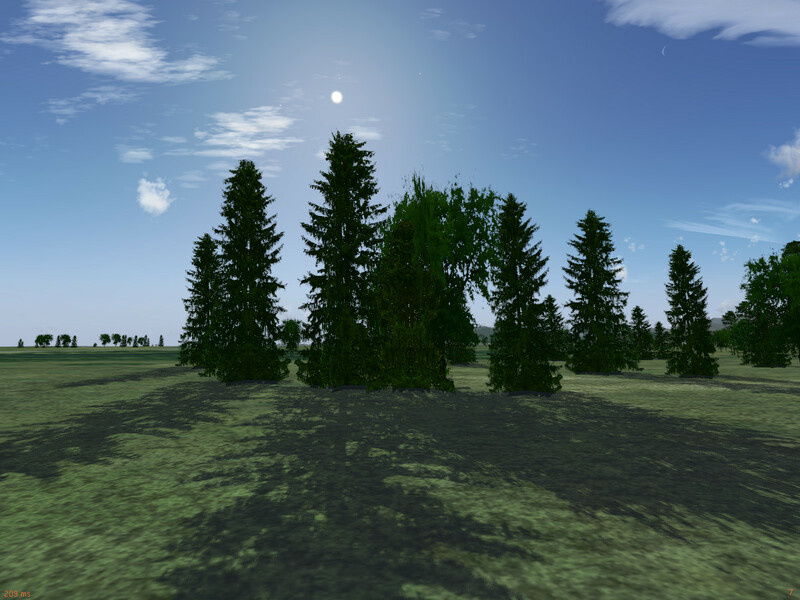 The correct dependence of lighting with illumination of the scene has been added. In Advanced Weather, droplet size and rain intensity are now set independently, allowing to realistically render fine spray as well as splattering rain in thunderstorms. 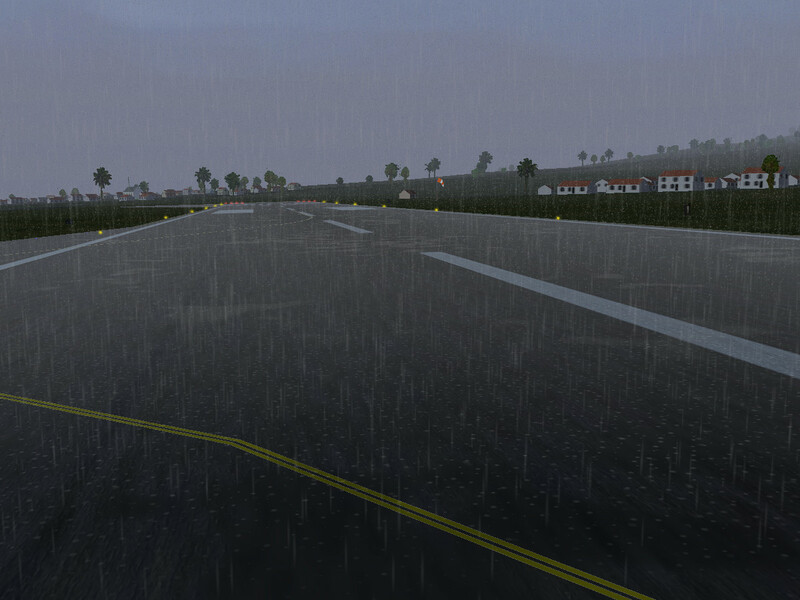 A dynamical splash-pattern of raindrops added to the Atmospheric Light Scattering (ALS) runway effect completes the visual impression. 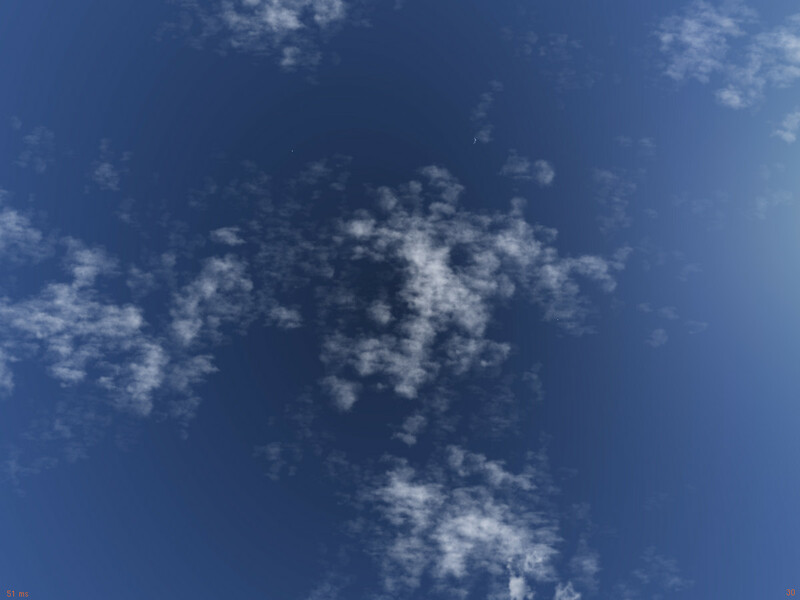 The cloud rendering system has received an upgrade, allowing to let the edges of cloud patches gradually fade out. This makes several types of cloud formations appear even more realistic. 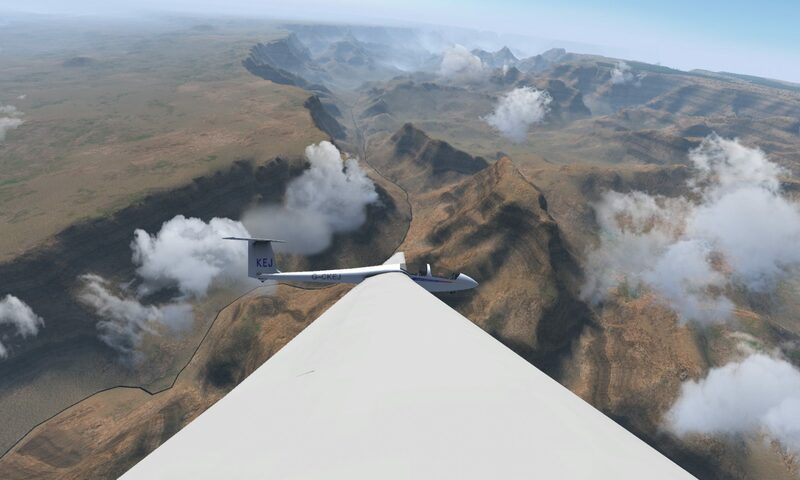 Have you ever wondered why the terrain appears bluish in the distance? 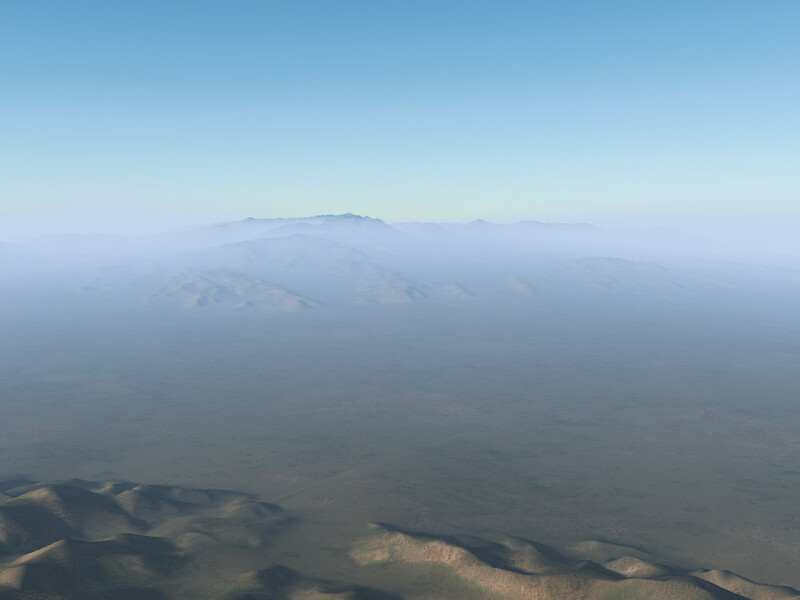 The Atmospheric Light Scattering (ALS) rendering framework has received a significant upgrade rendering the effects of Rayleigh scattering of light with air molecules and fine dust. This includes the in-scattering of light, resulting in the blue appearance of distant objects, as well as an out-scattering effect which makes colors seen through dry haze shifted towards the red. Combined with the already existing model for rendering hazes, this leads to truly impressive visuals. A new flexible CDU framework allows aircraft developers to set up extensive CDU pages with relatively little effort. The framework supports both 3D and 2D instruments, multipages, down selecting settings to the scratchpad and various input formats (e.g. FL115 or 11500). It comes with a 2D panel popup screen so you won’t have to pan around the cockpit all the time. The CDU is expected to be introduced on the Boeing 747-400, but the framework has been designed to be flexible and fit other airliners. 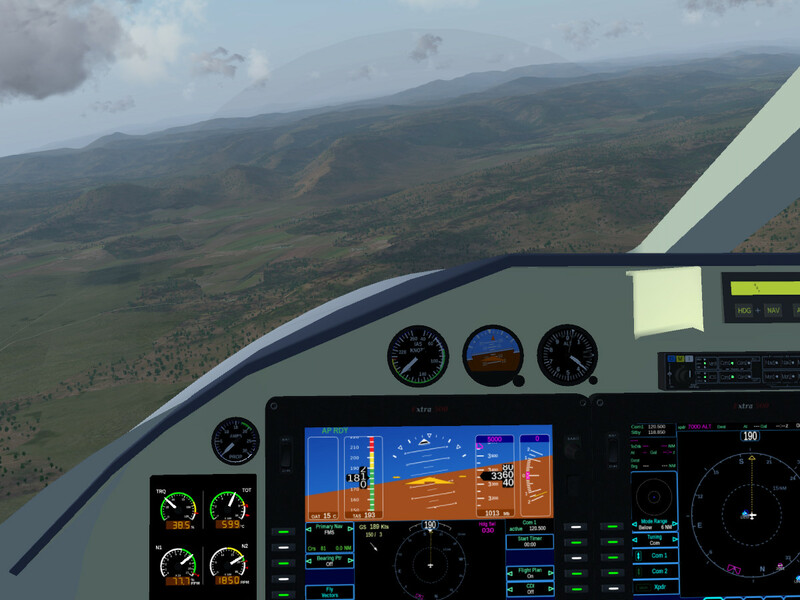 The Extra 500 introduces a luxury aircraft one of the most advanced glass cockpits to be simulated by Flightgear. The F-14b has received a significant upgrade with an added JSBSim flight dynamics model. There is also progress on a new version of the X-15 which might make it into the release, as well as the F-20. 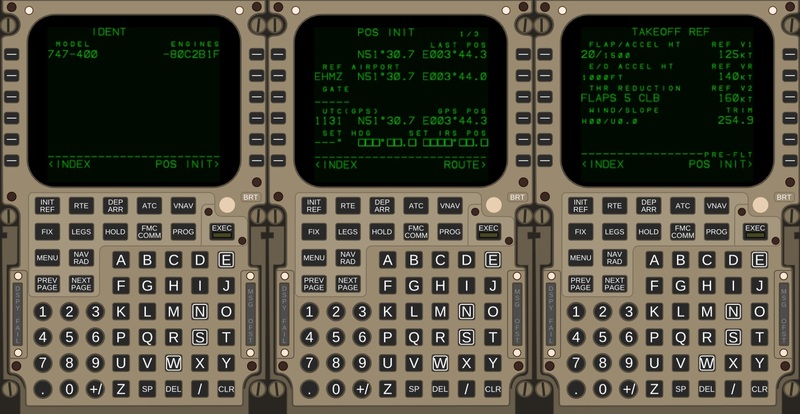 i want to have real airport scenery and airport service on flight gear 3.4…..
Flightgear runs fine on yosemite when you start it from the commandline. it’s just a launcher problem. everything else works just fine. thanks for the impressive work. keep it up! 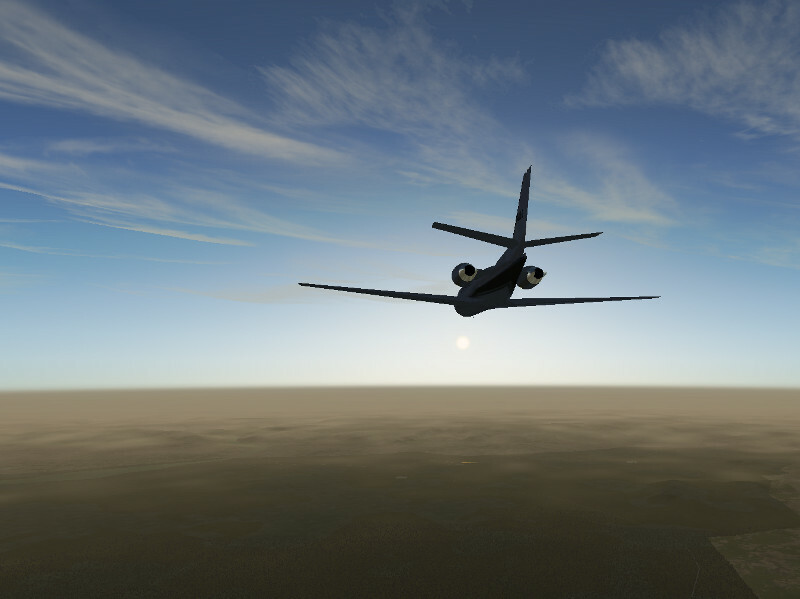 FlightGear and its community behind the scene is adorable! Thanks a lot for all your effort – hope I will find a way to contribute this project soon. Perhaps damage could be improved in 3.4? Things such as combat, overspeeding, wrecks, impacts and crashes have a ways to go yet. Damage modeling has to be done airplane side, so there won’t be a general solution forthcoming, it will always be plane-specific. Some airplanes (notably the MiG-15bis) already have pretty sophisticated damage modeling (try smashing it too hard onto the runway, and you’ll break the gear…), the majority however does not. There are efforts underway to provide a more general framework making it easier for aircraft modelers to implement damage. However, whether any particular plane will do this still depends on whether the maintainer is interested. Perhaps a built in system, using included data for various aircraft, could be used to “crash” the plane when the limits of that plane (according to the include generic data) had been reached? Unless you’re running very low graphics settings (which I would recommend lowering first if your framerate isn’t good enough) the relevant choke point is the graphics card (GPU). Probably more than 99% of all computation operations which are done are running on the GPU, so what processor you have (or how many) is in many cases simply irrelevant for the framerate you see. It looks great! Now I’m just wondering when I’ll be able to get my hands on these amazing new features. I may be wrong but the shadows of the trees as shown in the above picture, look like they are radially cast on the ground; however, the light is coming from the infinite (at least very far away – the sun), and in such a circumstance the shadows cast on the ground should be parallel. You are – the shadows utilize the same light vector as all other elements in the scene. I suppose what you see is a wide angle shot effect. Great Work on the release of 3.2 Developers, and loving these new features to hopefully come in 3.4. Looks great! I’ve been flying in fgfs 3.2 with rembrandt enabled instead of ALS, just to see the lighting and shadow effects – some aircraft such as the CRJ700 etc look amazing, but some still are not quite right in rembrandt – is the work in getting lighting and tree shadows included an effort to port rembrandt work into ALS? If the best of both of those could be combined FG would look amazing. Rembrandt actually renders with as high or higher framerates on my hardware than ALS does in 3.2. No, there is currently no plan I’m aware of to combine Rembrandt and ALS. You can burn framerate only once – any combination of the schemes would run significantly slower than the slowest of either alone. Sorry, I’m not sure I understand the question – how’d that be a feature in development? I think he means will this release be compatible with osx Yosemite. Ah. My understanding from scanning through forum posts is that the current FG works fine with OSX Yosemite, just the Mac launcher doesn’t, one has to start it from a terminal via commandline just like we Linux folks do. I don’t know what the status of the Mac launcher is, that’s a bit outside the main FG development. Yeap when we start from the terminal, we can enjoy whole the world covered by ocean :)) Please let me know where and how the ocean ends.. I swear i tried all i could. In the forum are people who claim that they run on OSX Yosemite fine from the commandline. Asking here in this comments section for Mac support isn’t helpful – all FG developers who typically answer here are Linux users, you need to go where the people are who can help you.